It’s Friday 13th but we land in Iceland on time and unscathed. Next morning we take the 9am ferry from Stykkishólmur across a smooth as glass Breidafjördur Bay to the little island of Flatey, where numerous Redshanks and Arctic Terns scold us from nearby fence posts, with Snipe drumming overhead and Snow Buntings singing from rocks beside the path, while we virtually have to step over super tame Red-necked Phalaropes! Just offshore there are Black Guillemots, Eiders and rafts of Puffins, plus more Phalaropes, but none of them are Greys. After a relaxing morning on this tranquil island, teeming with birds, we return to the mainland and spot Great and Lesser Black Backs in the same scope view as a Glaucous Gull. Heading west along the south coast of the wild Snaefellsnes peninsula, as far as the cliffs of Þúfubjörg, our target is Brünnich’s Guillemots and we find one sitting on the same narrow ledge as two Common Guillemots, one of which is ‘bridled’. There are also plenty of Fulmars and Kittiwakes and a few Razorbills here. On our way back to Stykkishólmur, we marvel at the geometry within the basalt pillars at Arnarstapi while further east, roadside pools produce Red-throated Diver on the right and Great Northern Divers on the left, along with Scaup, Wigeon and a proud pair of Whooper Swans with five cygnets. Leaving Stykkishólmur at 8.45am on a long scenic drive heading east, we find a pair of Harlequin Ducks at the inward end of Alftafjördur after just twenty minutes on the road. Other sightings along the journey include Whimbrel, Golden Plover, Arctic Skua, Raven, plenty more Whoopers and eventually a group of Pink-footed Geese with goslings. By late afternoon we arrive at Godafoss, one of the most spectacular waterfalls in Iceland, not far from Lake Mývatn, where a welcoming party is laid on by billions of ‘in your face’ flies, but at least they don’t bite. The rocky slopes of Vindbelgjarfjall on the west side of Mývatn are a favoured resting place for the fabulous Gyr Falcon and lo and behold we soon find one of these ghostly white falcons in the scope! Today we stay local with a clockwise circuit of the ‘Lake of Flies’, renowned for its prolific birdlife, and at the first stop, a Meally Redpoll lands in a bush just five yards away! Combing the shore, we find a Slavonian Grebe with eyes glistening like rubies, and as we scope the handsome bird, two dear little chicks with red and black striped faces peep out from under the parent’s arched wings, just like a scene from a Springwatch ‘nest cam’. The huge grey Hverfjall crater looms over the east side of the lake and we can’t resist the challenge of climbing to the rim for a panoramic view of this outstanding landscape, with the blue lake dotted with craters, while steam rises from distant fumaroles. Next stop is Dimmuborgir for a stroll through impressive lava formations, including an archway known as ‘The Church’, where many of the rocky pinnacles are used as song posts by Redwings. After lunch the thermometer reaches 19˚C and we find a bay choc-full of Barrow’s Goldeneyes with glossy deep purple heads, shimmering in the heat haze. At Skútustadir, we circuit a lake within a lake, enclosed by craters, and realise why the larger lake is called ‘Midge Water’ as the flies here are swarming in their billions, producing visible smoke-like columns and an audible buzz, making it a challenge to breathe without inhaling any! This insect bonanza is the reason for the prolific birdlife and so there are plenty of ducks, including Wigeon, Scaup, Red-breasted Merganser, our only Common Scoter of the trip, and smart drake Long-tailed Ducks, which display by raising their wiry tails in time with an unusual yodelling ‘song’. 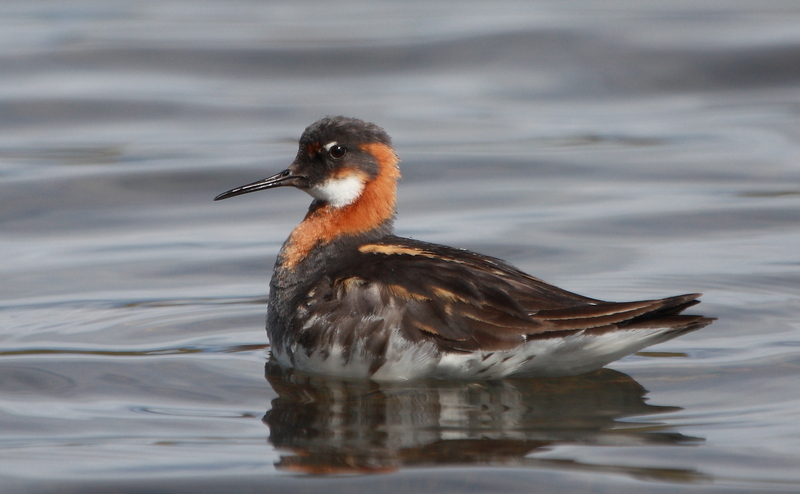 Red-necked Phalaropes also put on a marvellous show here at point blank range! Not far to the west, the lake feeds the fast flowing Laxá River, where we encounter several stunning Harlequin drakes, before returning to the hotel on the north shore, which stays bathed in brilliant sunshine until sunset at 11.25pm! After a brief dip below the mountains, the sun provides yet another beautiful warm sunny day with a deep blue sky, ideal for highlighting the sulphurous colour of the bare ground at Námafjall Hverir, where the Earth’s crust is so thin that steam heated by magma gushes out from vents called fumaroles, and pools of grey mud boil and plop like cauldrons of overheated porridge. Driving east through a dusty rocky desert, which could be in North Africa, we reach an awesome grand canyon where tons of glacial melt water, thunder 147 feet down a sheer cliff. This is Dettifoss, Europe’s mightiest waterfall, and yet the adjacent toilet block has a sign asking users to be sparing with the water as there is a shortage in this area! Returning west to Leirhnjúkur, steam rising from cracks in an unearthly lifeless landscape of crumpled black lava is reminiscent of the scene which might follow a nuclear holocaust, and yet even here there are Snow Buntings! An amazing day in an amazing place. This morning we leave the fabulous Mývatn area, still in need of a Ptarmigan, and on the drive north to Húsavík, we spot one in flight alongside the road. After an emergency stop we all pile out of the vehicle and scope the well camouflaged grouse, which still has a trace of white on the belly. Meanwhile a gorgeous rusty red Black-tailed Godwit is posing on a nearby fence post and as we admire it in the scope, it is replaced by a Whimbrel! 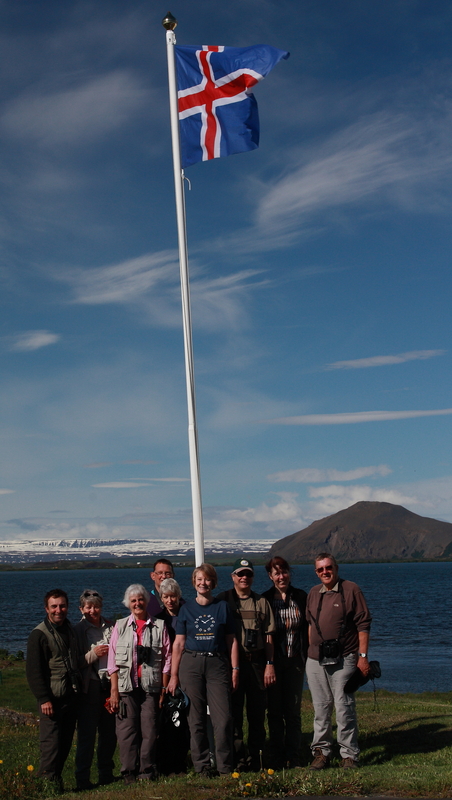 Húsavík is the whale watching capital of Iceland and we set sail across a calm Skálfandi Bay amid Puffins, Fulmars, Arctic Skuas and our only Great Skua of the trip, hoping for a whale. Within the hour we have two thirty five ton Humpback Whales less than 100 yards from the boat, and each time they surface, they blow a spout, arch their backs clear of the water and make a shallow dive, with trailing tail flukes showing really well. Next we spot two Minke Whales which weigh a mere 10 tons, followed by a group of White-beaked Dolphins. The snow clad mountains on the far side of the mirror calm bay provide a magnificent back drop for another Humpback Whale, surfacing amid hundreds of Arctic Terns. What a fantastic experience. We make an early start for a long but scenic drive southwest from Akureyri to Reykjavík, stopping in the steep sided Öxnadalur valley for plenty of Pink-footed Geese with goslings and a lovely show of white, yellow and orange Icelandic Poppies. The tarmac runs out on the F35 in an uninhabited desolate tundra landscape fanned by a chilly breeze, and I can’t believe our luck as a rare Arctic Fox crosses the ‘road’ ahead of us! It still has much of its thick white winter coat and turns to check us out before melting away into the frozen landscape. We are now many miles into the desolate interior of this remarkable island and yet there are still Arctic Skuas here. Not long after the Arctic Fox sighting I spot a large white bird flapping slowly across our path and realize in disbelief that it is a Snowy Owl! “Get out, get out” I shout and we all quickly disgorge from the vehicle as the owl lands on a gravel ridge. We now have this almost mythical bird in the scope. It is a pure white male with feathery feet and a large head that slowly turns, almost robotically, to scan the wide open landscape, watching us with large yellow eyes. I knew they occurred in Iceland but in such low numbers that I never dreamt we would actually see one. This is incredible but then I spot a second bird further away to the left! You wait a lifetime for a Snowy Owl and then two come along at once! Wow, this is epic and definitely one of the greatest moments in my birding career! After a good half hour watching the two owls, I still can’t believe our luck and we drive on to the hot springs at Hveravellir for lunch in the steamy atmosphere with a Snow Bunting foraging for crumbs on the car park. Continuing south to the Hvitá river we spot more Harlequin Ducks and a quick count adds up to at least 35 of these extremely smart birds. Soon the tarmac reappears as we approach Gullfoss, an impressive double waterfall, fed by melt water from the massive Langjökull glacier. Next we visit the famous Geysir, where a small group of onlookers gasp in amazement at each ebullient eruption. The pool of hot water ebbs and flows with a gentle welling action, gaining momentum each time, before exploding with clockwork regularity into a plume of steam as high as a house. 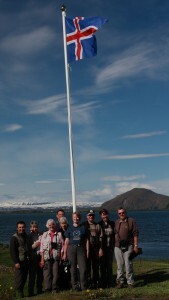 We cross the North Atlantic rift between the Eurasian and North American plates at Þingvellir to complete an amazing journey packed with exciting and memorable experiences.